During the month of May this year, John Davies spent 90 minutes each day for 10 days in the public green space of the Meadows parkland. He asked a total of 114 adults if he could take their picture. 98 people agreed to have their portraits made to be included in exhibitions to help promote awareness of the potential loss of the Meadows. 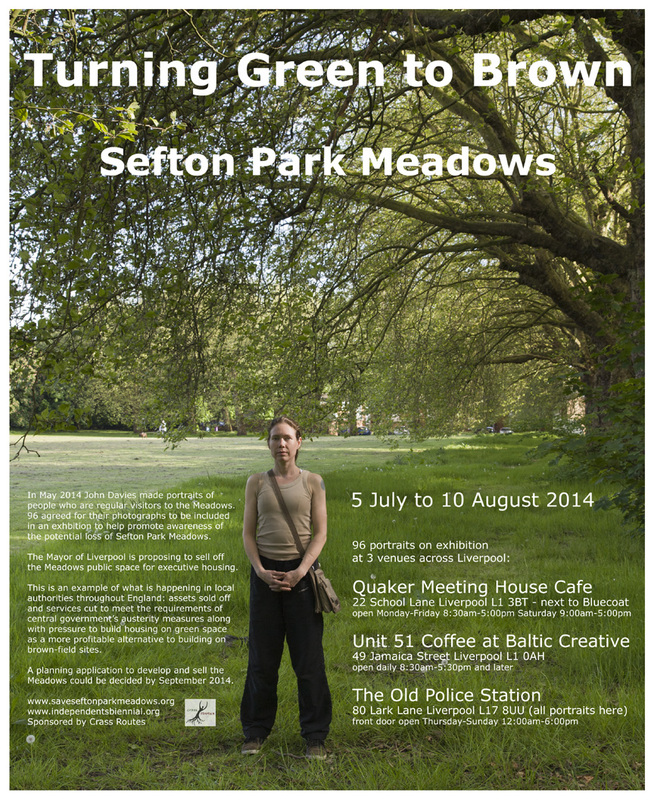 The Mayor of Liverpool is proposing to sell off Sefton Park Meadows for executive housing. This is an example of what is happening in local authorities throughout England: assets sold off and services cut to meet the requirements of central government’s austerity measures along with pressure to build housing on green space as a more profitable alternative to building on brown-field sites. A planning application to develop and sell the Meadows will probably be decided by September 2014. Open Monday to Friday 9:00am-5:00pm & 6:00-10:00pm. Open daily 8:30am-5:30pm or later. Open Thursday to Sunday 12:00am-6:00pm. All portraits will be shown at the Old Police Station on Lark Lane. These will be all together in 2 big frames. Other venues will have a selection of large prints. Categories: IDEAS | Tags: Biennial, Biennial Photography, Biennial Photography Exhibition, campaign, conservation, council, disposal, environment, green, health parks, housing development Liverpool, Joe Anderson, liverpool, Liverpool Biennial, Liverpool City Council, Loss of openspace, Mayor, meadows, Park Avenue, Photography, Photography Exhibition, Sefton Park, Sefton Park Meadows, Sefton Park Meadows campaign | Permalink.